The M-117R: a reissue of the infamous original. Back by popular demand, the MXR M-117R Flanger creates a variety of wild sounds from dynamic jet plane or cool space effects to short delay, chorus, and vibrato. You have complete control of the filter so you can sculpt the sound you want. Back off the Width setting to zero to disengage auto-sweep, then use the Manual knob to physically place the effect anywhere along the frequency spectrum! Use with guitar, bass, keyboards, and vocals. The M-117R effects pedal has 4 knobs and a footswitch. The footswitch toggles the flanger effect on/bypass (red LED indicates on). The Manual knob selects the frequency center of the effect when auto-sweep is disengaged. The Width knob at zero disengages auto-sweep, but when you rotate it clockwise, it increases the total phase sweep of the effect. The Speed knob modulates rate of effect. The Regen knob feeds the effect back onto itself at adjustable intensity, increasing the total phase effect. Powered by battery or included Dunlop ECB-004 AC adapter. 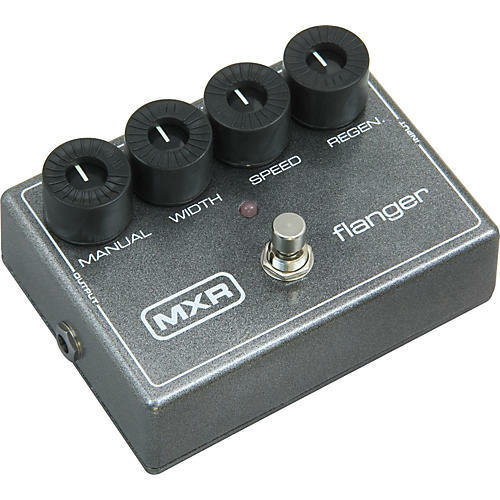 The MXR Flanger puts a cornucopia of far-out sounds all at your fingertips. Call and get your M117R today.